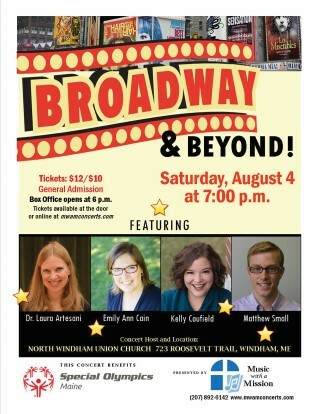 Singers Emily Ann Cain, Kelly Caufield and Matthew Small, along with pianist Dr. Laura Artesani, will perform “Broadway & Beyond” at 7 p.m. on Saturday, August 4 at the North Windham Union Church as part of the organization’s Music with a Mission series. The upcoming concert will mark the sixth straight summer concert for this popular local ensemble. 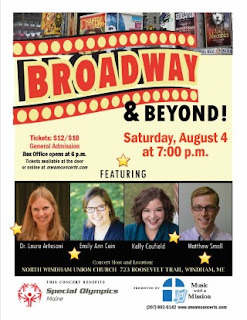 This original “Broadway & Beyond” team of friends has joined forces to perform musical theater, pop standards and more for nearly two decades; often in support of worthy causes, including Special Olympics Maine and others. These New England-based entertainers relish the opportunity to connect with one another and their audiences through music. Aside from their many concert appearances as soloists and ensemble members, Cain, Caufield and Small have appeared together with the University of Maine Singers, UMaine School of Performing Arts productions, Renaissance/The Maine Steiners acapella groups, Schoolhouse Arts Center at Sebago Lake and other performing arts organizations. Dr. Artesani worked with the trio of singers for several years as their music professor at UMaine. over $57,000 for mission support to the church and other community organizations. The “Broadway & Beyond” performers have once again decided to support Special Olympics Maine with the community proceeds from this concert. Tickets will be sold at the door and are $12 for adults and $10 for students, children, and seniors. Tickets are also available in advance on-line at www.mwamconcerts.com and through the church office from 9a.m. 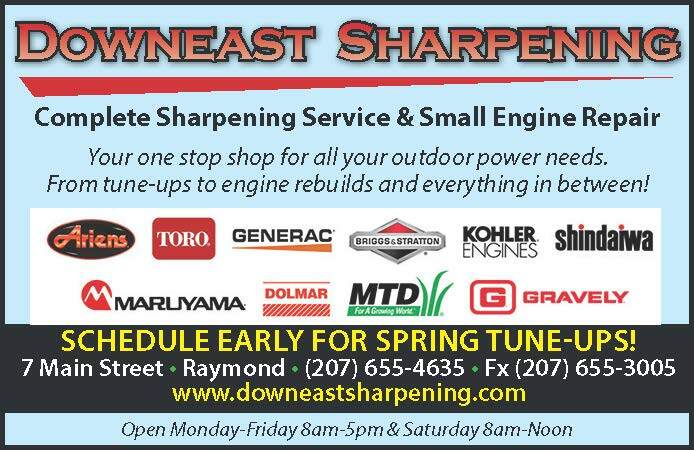 to noon Monday through Thursday. The box office opens at 6:00 p.m. and the doors will open at 6:30 p.m. The North Windham Union Church is located at 723 Roosevelt Trail in Windham and is air-conditioned for your comfort. For more information please call 892-6142 or email MWAMconcerts@gmail.com.